As we have entered the (2015) College Football(CFB) season, there are certain facts and evidence in the scheudling practices in college football at the FBS level that the mainstream media (i.e. ESPN, FOX Sports, USA Today Sports and others) members will not discuss, investigate or even discuss on the airwaves or in print. Every CFB season, the media starts to discuss game schedules, both conference, non-conference and FCS scheduling. Let me offer you the statistical information from the (2015) FBS season associated with the FCS scheduling, non-conference scheduling, current results and data. Since the (2015) CFB season is only 2-weeks in, the majority of the games have been non-conference based and FCS based. This (2015) FBS season there are 107 scheduled FCS games scheduled versus the FBS programs. Some of those FBS programs have scheduled 2 FCS games this season: Army, Boston College, North Carolina and Wake Forest. Those 4 FBS programs could have scheduled each other, eliminated the FCS games and are regionally located to each other. The current results of FCS scheduling after 2-weeks of FBS play shows that the FBS record is currently (65-5) against the FCS programs with a win-loss percentage of .929%. The FBS programs are outscoring the FCS programs by an average of 32.3 points or 4+ possessions. The FBS programs have scored 45.9 PPG compared to the FCS scoring only 13.6 PPG. In addition to the current overall record, win-loss percentage and points per game (PPG), the FBS programs have totaled up 3173 points while only allowing 953 points. Taking that data one step further, of those 70 games scheduled by the FBS versus the FCS, the FBS has outscored the FCS programs by 3+ possessions or more 53 times this season. A possession is equal to a team possessing the ball and the oucome being scoring a touchdown with the extra point. This indicates and suggest that there is a significant need for scheduling changes at the FBS level of play in the NCAA. These results indicate that the SEC still possesses a large amount of FCS scheduled games left to significantly show that they FEAR scheduling competitve FBS non-conference games during the FBS season or even schedule FBS non-conference games on the road. The majority of the remaining FCS games are scheduled in the up coming weeks. However, there is one exception to the last FCS scheduled contest. For you SEC fans, Alabama has scheduled Charleston Southern the week before Alabama plays their annual rivalry game versus Auburn. This shows and indicates that Alabama is even afraid to schedule a credible FBS non-conference opponent that week but would rather schedule an automatic win, pad thier statistics and increase thier mirage like credibilty to the media, fans, subjective voters and the in-experienced college football playoff committee in hopes to be selected for one of the four playoff spots. The FCS scheduling practices do need to change and will be changing in the future among FBS conferences and programs. Besides examining the FCS schedule for (2015), I also examined and analyzed the non-conference scheduling data. In the same book I authored and self published, I wrote and dedicated a chapter to the non-conference scheduling practices at the FBS level of play in the NCAA from (1996) through (2013). The current (2015) FBS non-conference scheduling practices are no different, in addition to supports the findings in the research that I performed and wrote about in my self published book. The results of the (2015) FBS non-conference scheduling practices are conclusive to the historical data and results in which were previously examined about the consistent and prominent issues that specific FBS conferences, more specifically the BCS or Power 5 conferences possess. The results of the (2015) FBS non-conference scheduling data determined that the SEC significantly increased thier home field advantage practices associated with the non-conference scheduling during the FBS schedule. The SEC has a non-conference scheduling home field advantage for the (2015) FBS season of 85.6%. That means 8 or 9 games out of 10 games accociated with the non-conference schedule are scheudled at home. This is the highest percentage rate among the FBS conferences this (2015) season and almost a full 5% increase since the (2013) FBS season. Thus providing another significant advantage in home field scheduling, another mirage to the subjective voters and the very in-experienced college football playoff committee to determine who should be ranked higher than whom. The next closets FBS conference with a non-conference home field advantage is the Big 10 at 75.0%. Almost 10 full percentage points less than the SEC and compariable to thier historical non-conference scheduling practices. What would the NFL owners say if the New England Patriots told the rest of the league to jump in the lake, all of our non-divisional games are going to be played at home except 1. And the primary argument is we make the most money for the NFL and we won the Super Bowl. The owners and Commissioner Roger Goodell would probably tell owner Robert Kraft some choice words and vote it down. Seems the SEC can schedule their non-confernce games anyway they want with a significant advantage with NO repercussions associated with subjective polls and rankings or being discussed about in the media. The SEC possesses this roman and peasant like image, with the SEC being the Romans and the rest of the FBS being peasants. I examined the non-conference scheduling data further and discovered that the SEC has 7 of the 14 programs possessing 4 extra home games in thier non-conference schedule with 0 away games in their non-conference schedule this FBS season. Those 7 SEC programs are: Alabama, Arkansas, Auburn, Florida, Kentucky, Mississippi State and Tennessee. Compared to the rest of the 114 FBS programs there are only 5 FBS who do not play any away game in thier non-conference schedule this (2015) FBS season. Those FBS prorgams are: Arizona State, Boston College, North Carolina, Toledo and West Virginia. This is supportive evidence that proves that the SEC takes full advantage and makes the conscious decisions in college football about scheduling, but college athletic is a business with no balance in scheduling. The comments that will come from the SEC fan base and media supporters will be Alabama played Wisconsin on thre road. The fun fact is Alabama only travled 600+ miles to Dallas and Wisconsin traveled 1000+ miles to Dallas. Serious question to the SEC staff, media and major media members. Take the media money (i.e. ESPN) and Dallas Cowboys owner Jerry Jones offer to have the use of ATT Stadium as the site for the begining of the FBS season off the table. I believe and do know that Camp Randall and the hotels and business in and around Madison could handle the influx of tax based dollars in Madison, Wisconsin. So my question is: Why can’t Alabama travel to Madison, Wisconsin and play at Wisconsin? Or in (2014) was traveling to Ann Arbor, Michigan to far for Alabama? Or is it that the those Big 10 stadiums hold more than or close too 100,000-plus fans and the SEC does not know how to play in front of that many people. Or is it that the SEC primary constiuencies fear losing there and would lose thier strangle hold on the college football hiearchy and could lose credibilty by losing in Madison or Ann Arbor. Thats the answer. If I were an athletic director at one of those FBS schools outside of the SEC, I would ask or dictate to the SEC for a Home and Home series, no neutral sites. Or if its a one game scenario, you come here. I an not traveling to you, even possibly beat you in your stadium and receive no credibility in ranking from your coaches in the polls or credibilty from the media. Pack your bags and travel needs and come to my home stadium. I know I would sell out the seats in my stadium, increase tax based dollars in my community and maybe draw ESPN College Game Day to my campus. The rest of the FBS programs need to stop catering to the SEC, this is college football sponsored by the NCAA. The SEC and thier power brokers do not make the rules. To the sports media and college football fan base, these are the facts from the data that was collected, examined and analyzed. If you want to debate or refute my data and statistical information, please try. I accept all arguments from the media and fan base, but I argue and debate with facts and evidence, not emotions or what you believe. To the sports media in print, radio, television and web based writers, please do not forget to use the APA/MLA method when siting your souces if you decide to openly talk about, write about or discuss on air where you read the information. If you have any questions pertaining to this posting please contact me. Final Note: I am re-editing, adding 4 new chapters updating statistical data, adding more tables and data, read more peer reviewed articles to support my arguments and writing my book again. I will be re-publishing in the immediate future. The USA Today Sports. (2015). Special Edition: College Football. FBS Schedules. Pg. 56-58. A USA Today Publication, Gannett Co. Inc.
Siggelow, M. (2013). College Football in the BCS Era: The Untold Truth. self published at Lulu.com. The 2014 NCAA/FBS Field of 16 is ready to be announced and WAY before the “SIGNIFICANTLY INEXPERIENCED” CFP committee who are using variables to select with no true criteria, changing their minds on head to head, using a variable of “game control” which possesses no peer reviewed research to be used as a variable of objective matter with credibility. I have also caught the CFP committee chair contradicting himself every week while being interviewed on ESPN every Tuesday for the past 5+ weeks. I will post 2 ways that the NCAA/FBS field of 16 could resemble. When you review the pairings, I have my own criteria which is researched based, objective, subjective and I possess no bias against any FBS team. I do not possess any agenda nor do I use a made up variable which is not peer reviewed supported. Seeds are earned based upon the professional model theory and how the FBS programs schedule. This would be the first round of games held first weekend of December. Pairings are shown in the traditional 16 team bracket format. The better seeded team, meaning the lower the seed #, you host the first round game. The only games that have playoff seeding implications are Kansas State vs. Baylor and TCU vs. Iowa State. Missouri (10-2) last team out. On a side note: I have been updating my book statistically,adding more tables, adding 4 new chapters and making some adjustments to the chapters. The target release date is planned for March 2015. With the conclusion of the 2013 FBS/NCAA college football season complete, now is the time to announce the fictional field of 16 based upon my research and findings. I know many of you will have issues with how I seeded the field of 16, but please remember the professional model theory, which I used as a basis to seed the field of 16. On a side note, I have been asked by twitter followers; if the 4 team playoff were to start this season, which 4 teams do I think would make the field? After reviewing the pool of FBS/NCAA teams that I believe would be considered and to narrow that field down to just four, my (4) teams would be in no seed order: Florida State, Ohio State, Northern Illinois and Auburn. Teams on the outside looking in: Michigan State, Stanford, Central Florida and Alabama; maybe in that order. That’s just my opinion. Now to the field of 16. First off remember I do not include conference championship games as part of the regular season. The regular season ends after 12 games. Only 12.8% of the FBS/NCAA football programs compete in a 13th game, those primarily being conference championship games along with Hawaii usually invites an FBS program out at the end of the season for a 13th game in December. What a 13th game on your FBS schedule prior to final exam week a weekend or couple of days in Hawaii. SIGN ME UP!!!. Since ALL of the FBS/NCAA programs do not play or schedule a contractually obligated 13th regular season game or ALL conferences possess a conference championship; then those 13th games cannot be factored in. Conference championship games are earned, not scheduled. For those SEC fans and 30+ Million college football fans, ask yourself this, when the 2013 FBS/NCAA football season schedules were announced, finalized, published, viewable on the World Wide Web in late spring or early summer of 2013; look at the end of your teams or various teams schedule? Someone please tell me or show me who scheduled, meaning those teams have a contractual obligation to play, not forecasting, the conference championship game and whose schedule shows which bowl game they are going to participate in? What many of you fail to comprehend is the conference championship game and bowl games are earned extra games, not automatically scheduled. In addition to that previous comment, MANY college football fans, audience, sports reporters and the Expert Sports Programming network fail to comprehend is that the BCS computerized system accounts for the 13th game for those who played a 13th game but possess a negative factor or accountability to those NCAA/FBS programs who do not play a 13th game to counteract the data and not skew the numbers. If I remember my math and statistical analysis from my Master class, uneven data when comparing 2 teams or a group of teams and data makes for a non-interpretive information.13 does not equal 12, a.k.a conference championship games being the 13th game and the regular season ending with a 12th game. Yes, there were some great, exciting and upset conference championship games yesterday from what I could view, while I was on break at work yesterday during my 16 hours, but I cannot factor those results into my fictional field of 16 based upon research and historical factors. And now for the selection, seeds and where the big games will be played. Better seeded teams host 1st round games because they EARNED it, after that its all neutral bowl game sites. Second week of December off for final exam week. Round 2 Bowl Games played 3rd weekend of December like they are usually. Rose Bowl and Fiesta Bowl played on the same day on New Years Day. NCAA/FBS College Football Championship Game played 7 days later in the Orange Bowl with the 2 remaining programs. 13 NCAA/BCS/AQ programs were selected and 3 NCAA/NON-BCS/NON-AQ programs were selected. All 125 FBS/NCAA programs have an equal opportunity to make the field of 16, with the exception of those FBS/NCAA programs placed on probation by the NCAA for rules violations and completion of their investigation. ALL 0-loss and 1-loss teams made the field and only (35) of the (8) 2-loss teams were selected and the remaining (3) were considered but on the outside looking in (Clemson, Duke and Arizona State). Sounds familiar, better get use to it next year. Conference representation and well balanced. 8 of the 10 conference were represented. Only the Sun Belt and Conference USA were not selected. Closets teams from those (2) conferences to be considered were Rice at (9-3) and Louisiana Lafayette at (8-4). Imagine if this were true……..and reality…..the fun we would have watching college football for 5+ weeks. Please be respectful of my selections, because this time next year, you the fans and the college football audience are relying on an very in-experienced group of 13 to select 3.1% of the field and some programs will be on the outside looking in. I respect that many of you may have issue with, dislike, difference of opinions on the how I seeded the field of 16, remember this is FICTIONAL, based upon my experience of reviewing thousands upon thousands of data points. At least I am fair and honest with my selection and on one paid me $$, called me on the phone, sent me an email to consider or lobby for their FBS/NCAA program over another. This is totally un-biased. This could be a possibility in the future for college football. I could also sense that all of you would agree that this is a great field of 16 and the FBS teams I left on the outside looking in you would agree with. This type of college football playoff format would more than make college football in December and through the New Year, VERY enjoyable to watch and root for some great games and or even rematches. I did a selection process in only hours today, in which the future college football playoff committee will take days to complete, debate and publish. I even published this before ESPN could have their selection show. If you have any questions or would like to pick who would advance, please tweet me @cfbpoexpert or leave a comment. With the 2013 college football season coming to a close and many key games left to decide who should play for the national championship, what would happen if the crystal ball I look into came to fruition. Since college football only play 12 regular season games and only 10% of the college football FBS program only play a 13th game then my playoff brackets are starting to take shape. Currently(12-0) Northern Illinois is in the club house as then leader and only 0-loss FBS program. As I shake my crystal ball this is what I think about. Not predictions, but the what if game from what I would like to see happen. Shakes my crystal ball and this is what I see…..
Alabama(11-0) loses to (10-1) Auburn. Thus making the SEC with no 0-loss teams and Alabama’s dreams of a 3-peat dissolved.Not playing in championship game is a requirement, if I recall eliminates you from final game consideration. Alabama falls to (11-1) and Auburn moves to (11-1), eliminating Alabama’s chance to compete in the SEC final game. Missouri (10-1) loses to Texas A&M (8-3). Missouri falls to (10-2) and Texas A&M moves to (9-3). South Carolina (9-2) beats Clemson (10-1). South Carolina moves to (10-2) and Clemson falls to (10-2). This sets up the (10-2) South Carolina and (11-1) Auburn for the SEC final game. South Carolina beats Auburn in final game making South Carolina (11-2) and Auburn (11-2). This makes the SEC a mediocre conference, not the toughest and the 7 championship run stopped. Florida State (11-0) loses to Florida (4-7) in the battle for the state of Florida. Now that’s an upset. Florida State falls to (11-1) and Florida moves to (5-7) to save their season. That makes no 0-loss teams in the ACC. The ACC Coastal Division winner most likely Duke (10-2), pulls off the upset in the ACC final game by upsetting Florida State making Florida State and Duke both (11-2). We add two more FBS/BCS programs to the pool of 2-loss teams. Ohio State (11-0) loses to Michigan (7-4) in the final game of the season. Ohio State falls to (11-1) and plays in the Big 10 final game. Ohio State’s loss makes them the last 0-loss team in the BCS/FBS level to lose. Michigan State (10-1) loses to Minnesota (8-3) in the final game. Michigan State falls to (10-2) and will play (11-1) Ohio State for the Big 10 final game. Michigan State beats Ohio State in the final game, making Michigan State (11-2) and Ohio State (11-2).Ohio State, just like the SEC and Alabama, plays a Democritus style schedule fearing traveling to play out of their region. Baylor (10-1) loses to Texas (8-3) in the final game. Baylor falls to (10-2). Oklahoma State (10-1) loses to Oklahoma (9-2). Oklahoma State falls to (10-2) and Oklahoma moves to (10-2). This makes the Big 12 still competitive but not worthy of playing in the final championship game. The Baylor mystic and run was great for college football, someone else to talk about besides the SEC. Central Florida (9-1) wins their remaining two games versus South Florida and SMU, making Central Florida (11-1). Louisville (10-1) loses to Cincinnati (9-2) to make both Cincinnati and Louisville (10-2). The American Conference would then possess (1) of the (2) remaining 1-loss programs at FBS/NCAA football. Remember this is the conference that will lose its automatic bid to a MAJOR BOWL game during the New Year’s Day Bowl games run in the 2014 season. This is due to the fact that they are adding NON-BCS/NON-AQ programs to their conference. Interesting these 125 college football FBS/NCAA programs all compete at the same level, but they are segregated based upon athletic budgets and money. Northern Illinois wins the MAC final game versus Bowling Green or Buffalo, making Northern Illinois (13-0). Fresno State wins their remaining games with San Jose State and wins the Mountain West Conference final game versus Utah State or Boise State. Fresno State wins the final game in the Mountain West and moves to (12-0). Two NON-BCS/NON-AQ/NCAA/FBS programs remain un-defeated and both should be playing for the national championship. However, the powers that be keep both out of the final game and only reward one of them for a BSC bowl game. How pathetic of a system college football has, reward those with money and notoriety, and leave those who earned a very credible record out of earning more money, increased exposure and national attention. This leaves both Northern Illinois and Fresno State as the last 2 0-loss programs, Central Florida and Alabama the only 1-loss teams. So who gets into the final game? What will the future playoff committee do then? What experience does this committee have in making the right decision and not a decision based upon name recognition to put a name brand in the championship game over those student athletes and coaches from non-high profile levels. It’s an easy decision from my perspective… both 0-loss programs make the final game. Let the wins speak for themselves and not individuals whose pockets are endlessly lined with lots of money to significantly influence the decision. Anyone else feel the same way? I guess my crystal ball can have some hope as I watch the last 2 weeks of the college football season. Have a safe and enjoyable Thanksgiving Holiday…. On November 24, 2013; the FCS Committee released the 24 team field for their annual NCAA FCS Football National Championship. I reviewed and examined the field of 24 and found that, like the NCAA Men’s and Women’s March Madness brackets, some credible programs are left scratching their head, after reading a recent and un-authored blog post from ncaafootball.com called “In the Huddle: Nothing Simple about the FCS Selection”, posted on November 24, 2013. The one interesting point made in the article by Head Coach Dino Babers from (11-1) Eastern Illinois, who received a 1st round BYE summed it up the best “Subjective, Objective, Computers, the Eye Test, it still comes down to winning games” (NCAAFootball.com, 2013). If winning and your overall record is the most important aspect to measure who makes the field, then why must we have this complicated subjective, bias and manipulated BCS system to determine which programs are given a significant advantage and the opportunity, not truly earned the opportunity, to compete for the NCAA/FBS Mens Football National Championship. Of the 24 berths for the FCS programs; 9 are Conference Winners and the remaining 15 are at-large berths, selected by a committee. Yes, 15 at large berths not 4 like the future College Football Playoff system in 2014. After reviewing the brackets and analyzing the berths, who made it, who earned a 1st round bye and who was left on the outside looking in. As I examined the FCS brackets, I looked for the FCS program with the least credible record. The purpose of that was to expand the list of at large berths of teams who should have been examined, evaluated, assessed to make the field. Furman (7-5), who finished tied for 1st in the Southland Conference was selected to participate. That means every FCS program that was not selected with a (7-5) record or better has a legitimate argument on why they were left out. 24 FCS programs met or exceeded that requirement and are scratching their head why. Remember what Coach Babers said ” still comes down to winning games”. Of the pool of additional at large FCS programs that should have been reviewed and possibly selected, 7 of the 24, or 29.1% equaled the Furman (7-5) record. 5 of the 24, or 20.8% possessed a record of (7-4) minus 1 game which could have either made their record (8-4) or (7-5) as Furman. The additional 12 of the 24 or 50% of the field possessed a win-loss record better than (7-5) Furman but were left out of this playoff tournament and scratching their heads. We meet the criteria based upon what Coach Babers said but we are left out, that does not make sense. More interesting fact is the IVY League was left out of the whole playoff tournament. (8-2) Princeton and (9-1) Harvard left out. I wonder what the committee was thinking. The remaining list of FCS programs that were left out of this playoff field were: (10-2) Mercer(Pioneer Conf. ), (10-3) Charleston Southern(Big South), (9-3) Alcorn State (SWAC), (3) (8-4) FBS programs Liberty(Big South), Youngstown State(Missouri Valley), Chattanooga (Southland) and (4) (8-3) FBS programs Lehigh(Patriot), San Diego and Marist(Pioneer), and Jackson State(SWAC). Count them, 12 FCS programs with better records than (7-5) Furman and left out. Based upon Coach Baber’s comment, Mercer and Charleston Southern need a full explanation, followed by Alcorn State. 10 win and 9 win seasons and they are on the outside looking in. I know the selection committee has a tough job of seeding and then selecting the at large berths. The most interesting fact is of the 126 FCS programs 24 or 19% of the pool is selected. Of that pool, 48 or 38.1% were eligible for examination, assessment and possible selection. Something I examined in my book “College Football In the BCS Era, The Untold Truth: An Analysis of Factors that Supports the 16 Team Playoff Model” was a larger field creates a better pool of programs to select from and seed. The future College Football Playoff Committee starting in 2014 will be only selecting 3.1% of the field or 4 FBS programs. I cannot wait until the large group of FBS programs that are on the outside looking in start lobbying and saying, ” we have the same record or better than team X, how were we left out”? How is this committee going to determine what variables to use and analyze. Their committee responsibility just got harder. If the FCS Committee has trouble selecting and seeding 24 FCS programs and still leaving credible programs on the outside looking in, how will this new FBS Playoff Committee handle the selection process. That is the $50+ Million dollar decision they signed up for, nominated for or were told they were on the committee. My hat goes off to the FCS committee who takes on the tough task but at least fair process in selecting and seeding the 24 FCS programs. I think what makes this FCS selection and seeding process so simple or easier is, there is not $50+ Million dollars in the balance in the selection process. Just the prestige, honor and recognition of being called NCAA FCS Men’s Football National Champions. Take note FBS Playoff Committee.. your tasks and responsibilities has more layers to it than peeling an onion. Source: unauthored (2013). “In the FCS Huddle: Nothing Simple About FCS Playoff Selection”. Viewed on the ncaafootball.com website. November 24, 2013. In today’s, November 12, 2013; USA Today Sports page, they published an article written by USA Today sports writer; George Schroeder. The article titled “Playoff Committee Forms Its First Huddle” (Schroeder, 2013), opening comment in bold print by the author “Members focus on defining role for 2014 launch” (Schroeder, 2013). This was the first time the committee were to meet with all its members in the same place, same time to discuss several topics. Interesting missing from the committee due to other obligations were Mr. Arching Manning and Sen. Tom Osbourne. The committee meets or schedules to meet for the first time and they ALL cannot be present. First decision already and there is a fumble and a turnover. This is a responsibility in which you were selected, not elected and you all cannot make the first meeting. I can only see how future committee meetings will go from this point forward. You’re responsibility is to make a $50+ million dollar decision and you ALL can’t agree on meeting for the first time to make this committee show some credibility to the commitment to the importance of being part of the selected group. Another interesting point, to prove that the bias will still be associated with this committee, Mr. Bill Hancock, Commissioner of the BCS, is already making his presence felt along with his influence to the members of the committee, by being part of this process and photo opportunity. He was not selected to be part of this committee when the committee was announced a few weeks ago, then what is his motivation and purpose for being there? We all know what it is. From my perspective, if this committee is to receive credibility then people like Mr. Bill Hancock, Mr. Mike Slive and any other influential people who can use their higher centers of influence to dial up a committee member and make direct suggestions on who they would like to see in the 4-team playoff, should remain silent and distant. See, Mr. Bill Hancock already has a direct line, like the Bat Phone with Commissioner Gordon and Batman, to the committee chairperson; Mr. Jeff Long. Mr. Jeff Long is the Athletic Director for the University of Arkansas. See the direct relationship, bias, influence and higher centers of influence already at work and we have not even started the first selection process. There are more moral and ethical issues associated with this playoff committee than you can count on one hand. As I have said before in a previous posting/publishing, the committee is being asked to make a $50+ million dollar decision knowing they must select 3.1% of the field of NCAA/FBS football programs. Not only is the financial implication important, but their are members who are part of this committee who have never been part of an NCAA Men’s or Women’s selection committee but have not been following college football like a real administrator does or a sports fan, but were selected based upon name sake to provide the committee with name credibility, but possesses limited experience in selection committee process for team participation in one of the most visible playoff formats, outside of the March Madness for Men’s and Women’s College Basketball. The article continues on with Condoleezza Rice being quoted saying “I think it’s impossible, having been appointed to the committee, not viewing football games differently” (Schroeder, 2013). Mrs. Rice was also was quoted as saying “I try to watch more games- which in my case is almost impossible, since I already watch a lot of football” (Schroeder, 2013). With all due respect to Mrs. Rice, how many football games have you watched as a fan and how many have you watched to analyze not just the game but the season over many seasons? Watching football games as a fan is significantly much different when you need to make a multi-million dollar decision debating that cyclical triad or being persuaded by those committee members who have more football experience than you. You then become like one of the rats who follow the Pied Piper. Your thoughts and opinions become null and void at that point in time. This is not like throwing darts at a dart board and hoping you hit a bulls eye. You and the selected committee are making a $50+ Million Dollar decision that impacts not just 4 programs, but those programs who can also say “we should be part of that 4-team playoff”, “why were we left out”. Those teams left out will want answers, many 1-loss programs, possibly 2-loss programs and more specifically the Non-BCS/Non-AQ/NCAA/FBS member programs. This committee has made a decision to be part of this committee without examining the ethical and moral implications that this responsibility comes with. I hope that this committee can provide real answers and not have to take “back pedaling” or “deflection” classes when dealing with tough questions when being questions about the first field of 4. With college football being the most visible sport at the start of the school year, returning back to school, always in the media’s forefront and scrutiny, 35+ million fans attend games on a yearly basis and MANY millions more watch and follow college football; then this committee is under a large microscope to get it right the first time. Hard to do when you must select 3.1% of the field, $50+ Million Dollars in the balance and many higher centers of influence possessing direct lines of communication to this group of committee members. The committee will be examining what factors to use as measurable criteria to determine their selection process. Schroeder wrote in his article that “this committee will be expected to consider factors including conference championships, strength of schedule, head-to-head competition, common opponents and the effects of injuries” (Schroeder, 2013). Interesting factors to examine if you have never really examined, analyzed, assessed or cognitively understand the significance that not just those dependent variables play, but other dependent variables that impact the independent variable. In English, every variable within the college football season must be examined pertaining to the selection process on the college football 4-team playoff. Let me point out some interesting facts about the factors that are listed and published in this article. Conference championships, not ALL FBS conferences possess them. Conference championships only significantly help, the Big 10, Pac 12, ACC, and the SEC. Yes, the MAC, Conference USA and the Mountain West conferences possess conference championships, but theirs possess limited importance and significance to making this 4-team field. The Non-BCS/Non-AQ conferences are already behind the 8-ball as it is, why create a measurable criteria that eliminates a specific group? Strength of schedule, that is such an open ended number of variables, where do I start. You cannot truly significantly determine whose schedule is stronger than the others. The variables are like concentric circles over lapping with more bad variables than good. The one valid and key question I possess within this variable of the strength of schedule is, how do you as a committee view FBS programs who schedule FCS programs, the viability of those FCS programs who do not compete for the FBS championship, but play for embarrassment and the financial payday it comes with by playing those FBS programs? Before you start providing me with examples of Appalachian State and North Dakota State, published research in which I performed in my book states that FBS teams win 89.6% of those games versus FCS programs as of the 2012 FBS season (Siggelow, 2013). Also, FBS programs significantly outscore the FCS programs by 4+ possessions or 28.1 points (Siggelow,2013). That’s only looking at the final results from scheduling games versus FCS programs and not how many FBS programs or conference schedule and how they schedule FCS programs. Common opponents and head to head competition is a good measurable criteria but still has many factors associated with it. The factor of injuries is not a viable factor when determining a teams capability. Injuries are part of the sport or game and they occur and happen. Unless the committee has a magical crystal ball, like the sports analysts do when predicting game outcomes on the weekend, then using injuries as a factor is not a factor to examine. You cannot predict how a team will play with or without key players. Each game and play are distinctively different. This committee has a tough task in front of them, knowing this is a $50+ million dollar decision and many of them have no business being part of this committee, that’s just my opinion. I have more experience, knowledge and education to be part of this committee, strongly based upon research, examination and analyzing 25,000+ data points from 1996 to the present when selecting my fictional field of 16 for my college football playoffs. As the years progress, we know where this college football playoff is headed. It’s headed towards a more traditional playoff format of 16. It’s only a matter of time. I only speak of the truth as Sgt. Joe Friday said “Only the facts ma’am.. only the facts”. Schroeder, George. Playoff Committee Forms Its First Huddle: Members focus on defining role for 2014 launch. USA Today Sports. November 12, 2013. Page 3C. Siggelow, Matthew. (2013). College Football In BCS Era, The Untold Truth: An Analysis of Factors that Supports the 16-Team Playoff Model. Lulu.com, self published Matthew Siggelow. During the LIVE broadcast at 8:30PM, of the ESPN BCS Countdown Show; on November 3, 2013; Hosted by Rece Davis along with in-studio analysts; Jesse Palmer and David Pollack along with via satellite analysts Kirk Herbstreit; a VERY BIAS comment was verbalized across the air waves without delay or being bleeped out by the sensors at ESPN. This comment or statement was given by David Pollack within the first 10 minutes of the airing and rundown of the current BCS ranking in reverse order from 25 to 1. The rankings as of November 3, 2013 revealed that (2) Non-BCS/Non-AQ/ NCAA/ FBS members Fresno State and Northern Illinois were both ranked respectively and subjectively in order, Fresno State #16 from the Mountain West Conference and Northern Illinois #18 from the Mid-American Conference, both ahead of BCS/AQ member Louisville #20. Both Fresno State and Northern Illinois are respectively in the group of 0-loss programs currently, and no on talks about their success in the 2013 FBS season. David Pollack’s was asked by the host Rece Davis; what he thought about the current rankings. One of the first comments or statements made by David Pollack was “that the human voters of the USA Today Coaches Poll and the Harris Poll voters, need to re-examine their ranking process in how they ranked Fresno State and Northern Illinois ahead of AQ/BCS member Louisville. They should not be ranked ahead of an BCS/AQ conference leader.” This comment more than significantly implies that David Pollack is VERY BIAS against all or any Non-BCS/Non-AQ conference and programs and they do not DESERVE to be ranked higher than any BCS/AQ conference program leader. David Pollack is ultimately suggesting that the human voters and members from the USA Today Coaches Poll of 60 coaches and the 122 members from The Harris Poll should rank both Fresno State and Northern Illinois lower than Louisville. Ultimately suggesting that Fresno State, Northern Illinois or any other Non-BCS/Non-AQ/NCAA/FBS football program are not deserving of a BCS bowl berth, the large sums of money that comes with participating in those bowls no matter if they both end the season with 0-losses. This comment also suggest that the human voters NEED to manipulate their rankings or voting process to ultimately affect both Fresno State and Northern Illinois. Not only affect their rank but also affect their earning potential, recruitment and promotion of their more than credible football FBS programs, coaches and players. The ranking process or voting process is 100% subjective with NO true criteria to rank FBS/NCAA programs 1 through 25. Research performed by myself and published in my book “College Football in the BCS Era, The Untold Truth” examined both human subjective voting processes and determined that there is NO true criteria or process to vote FBS programs 1 through 25 and that their is a definitive bias among the voters against Non-BCS/Non-AQ/NCAA/FBS programs, both with coaches and human voters. His direct comment also implies and suggests that David Pollack is intentionally obstructing both Fresno State, Northern Illinois or any Non-BCS/Non-AQ/NCAA/FBS member from the the possibility of potentially earning, a right so deserving spot, to compete for the BCS National Championship Game or any of the double digit mulit-million dollar BCS bowl games; which would significantly provide any Non-BCS/Non-AQ conference and programs credibility, notoriety recruiting leverage and more exposure to the institution and their athletic programs.. Yes, it is David Pollack’s opinion, but an opinion with vested interest, negative intentions, significant intent to decrease the opportunity for those two football programs to increase their financial well being and to influence subjective voters to vote his way per his opinion. It’s very interesting that ESPN who employs, supports and seeks the advice from sports analysts such as David Pollack, allowed that statement to be aired LIVE and no one challenging his comment. Since ESPN analysts have an direct avenue via the airwaves of LIVE TV during games, LIVE ESPN TV shows, LIVE Sportcenter’s or LIVE radio shows, to voice their opinion which could ultimately be subliminal in nature, but also effective towards those who possess decision making skills when significantly LARGE sums of money are at stake which could assist those conferences and programs. David Pollack’s comment is so significantly and subjectively BIAS that when future BCS rankings are revealed, starting with the November 10, 2013 rankings, could ultimately affect both Fresno State, Northern Illinois and any Non-BCS/Non-AQ/NCAA/FBS member and keep them from playing for the National Championship or another large multi-million dollar BCS Bowl game. If I were the the President, Chancellor, Athletic Director or Head Football Coach of either of these two institutions, I would be on the phone to my legal counsel and starting legal action against ESPN, ABC, the BCS Countdown Show and naming David Pollack as part of a defamation lawsuit and or antitrust law suit to impede my ability to be recognized as a credible football program, participate in a lucrative BCS Bowl game and more. David Pollacks comment could ultimately change and impede the earning opportunities for both Fresno State and/or Northern Illinois as the 2013 season concludes. The only factors that separates the BCS/AQ/NCAA/FBS conferences and programs from the Non-AQ/Non-AQ/NCAA/FBS conferences and programs is MONEY, TELEVISION CONTRACTS and ATHLETIC BUDGETS. All 125 FBS programs in the 2013 season all play by the same rules, same game time, receive the same time outs, receive the same amount of scholarships(unless on probation by the NCAA), score the same amount of points during games, a touchdown is still 6 points, a FG is still 3 points and so on.The skills and knowledge of both the coaches and players are what determines the success of their season and the possibility of earning an extra game which includes extra revenue, exposure and recruiting opportunities. This comment by David Pollack could be viewed as damaging to the future earning potential of both Fresno State, Northern Illinois and other Non-BCS/Non-AQ/NCAA/FBS football programs. The Non-BCS/Non-AQ/NCAA/VBS conference and programs are already significantly at a severe disadvantage when it comes to competing for a national championship, a larger financial bowl berth, recruiting and earning the respect from sports analysts in various and multiple markets. The Non-BCS/Non-AQ/NCAA/FBS programs surely do not need a high profile sports program on ESPN, which is aired across the nation on multiple satellite and cable organizations to make their process any harder to earn credibility than what it already is at a significant dis-advantage. The comment, verbalized and made by David Pollack makes it significantly that much harder now for the Non-BCS/Non-AQ/NCAA/FBS programs or conferences to receive any credit for their current season accolades, when you have one nationally re-known sports program and company allowing statements such as David Pollacks to be aired LIVE. It’s very interesting that if you look at all the panels of ESPN analysts (and not just ESPN) across their college football shows in which they air, there is NOT one member who speaks on behalf of the Non-BCS/Non-AQ/NCAA/FBS football programs to promote them as credible programs and conferences. I would love the opportunity to be part of that panel and promote the Non-BCS/Non-AQ/NCAA/FBS conferences and programs. Challenging the so called “experts” to their intellect and knowledge. I would make sure that the Non-BCS/Non-AQ/NCAA/FBS football programs had a LOUD VOICE to be heard. Even Boise State with the success they had, and still have, could not even secure a BCS Championship Game with the 17 year’s success with the second highest win loss percentage among all FBS programs. In closing, I suggest and hope that ESPN go back and watch the tape of that November 3, 2013 BCS Countdown Show and see how close I am to what David Pollack suggests and says. It’s very sad that each year there are competitive Non-BCS/Non-AQ/NCAA/FBS football programs that earn 0-loss seasons but never given TRUE and meaningful support by the media or opportunity to compete for the national championship. Even with the future 4-team College Football Playoff format in 2014, we will still see 4 BCS/AQ/NCAA/FBS programs securing and competing for the college football FBS title and the Non-BCS/Non-AQ/NCAA/FBS programs and conferences still on the outside looking in. In my opinion, David Pollack should have documentation in his file and or terminated for his malicious intent to decrease the financial earning opportunity for Fresno State, Northern Illinois and other Non-BCS/Non-AQ/NCAA/FBS football programs. I do not think an apology is in order. I only report the facts and truths……. I know I am not the only college football fan who watched the ESPN BCS Countdown Show and heard what David Pollack said on that specific date and time, with what he was implying and suggesting with confidence. After giving this some hard thought and consideration after the announcement of the future College Football Playoff (CFP) and the selection of the 13 committee members who have been given the honor to make a $50+ MILLION dollar decision, I have decided to post a comment. 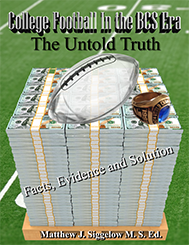 Since I did sole author and self publish a book “College Football in the BCS Era, The Untold Truth: An Analysis of Factors that Supports the 16-Team Playoff Model, which examined the selection of 16 FBS programs from a utilitarian aspect, with no vested interests, no bias, no favortism and considered all eligible FBS programs to be considered and reviewed to be selected and seeded into the field of 16, I am more than qualified to offer some expert-like analysis on this topic. This groups selection to this committee is to definitively select, without bias, 4 FBS programs out of 127 FBS programs to compete for $50+ million dollar and be called the 2014 NCAA Men’s FBS Football National Champion. How can this group of committee members provide a Stuart Mills approach when selecting these 4 FBS programs, knowing fully that every BCS/AQ conference and member will always be in the forefront of their mindset? I am not sure if many of our sports journalist are aware of the ever changing landscape within college football, but starting in the 2014 FBS Football season, there will be 127 FBS programs with the addition of Old Dominion to the CUSA and Appalachian State to the Sun Belt Conference. By 2015, there will be 128 FBS programs with the addition of UNC-Charlotte to the CUSA. By the 2014 FBS season, we are entrusting this committee of 13 members with no political ties, to select just 3.1% of the field at the FBS football program level, who compete under the same level of the NCAA, to compete in the first “so-called” College Football Playoff and an extra $50+ Million Dollars. The most interesting finding is, all 127 FBS teams compete under the same NCAA umbrella, play by the same rules but are classified and separated by athletic budgetary lines. Those who have the money will be significantly given consideration to increase that revenue by participating in this style of playoff format. Sounds very Democritus to me. The ultimate question that needs to be addressed is, the qualifications of this 13 member panel in which they were elected to make the ethical decision to select the right 4 FBS programs, without bias, making sure their relationships with other athletic directors, head coaches, conference commissioners; especially the power conference brokers such as Commissioner, Mr. Mike Slive; from the SEC (Southeastern Conference), Commissioner, Mr. Jim Delaney from the Big 10 and BCS Chairman, Mr. Bill Hancock out of the back pockets and keeping their ears to make sure their conference programs are considerably looked at to compete for the first ever CFB playoff format. On Thursday October 17, 2013; the local newspaper Greater Hazelton Standard Speaker, published an article written by Blair Kerkhoff from the Kansas City Star ” College Football Playoff committee officially unveiled”. The list was announced and published the 13 member committee who will have the job of making the selection. Examining this committee at first, we notice high profile names who are serving in roles as current athletic directors or past athletic directors & head football coaches, a Lieutenant and former superintendent in the United States Air Force Academy, the NCAA executive vice president, a vice chancellor, a big name NFL and NCAA quarterback legend, a big name basketball commissioner, a USA Today sports writer and professor and ex-Secretary of State. Mr. Jeff Long: Arkansas Vice Chancellor, Athletic Director and CFP Committee Chair(SEC and BCS/AQ member) BCS/AQ leads 1-0 on the panel. Mr. Barry Alvarez: Wisconsin Athletic Director(BIG 10 and BCS/AQ member) BCS/AQ leads 2-0 on the panel. Mr. Pat Haden: USC Athletic Director (PAC 12 and BCS/AQ member) BCS/AQ leads 3-0 on the panel. Mr. Oliver Luck: West Virginia Athletic Director (Big 12 and BCS/AQ member) BCS/AQ leads 4-0 on the panel. Mr. Archie Manning: NFL Great and Mississippi Alumni (SEC influence and BCS/AQ influence) BCS/AQ leads 5-0 on the panel. Mr. Tom Osbourne: Former Nebraska Head Football Coach, Athletic Director and Congressman (Big 12/Big 10 and BCS/AQ member). BCS/AQ leads 6-0 on the panel. Mr. Tom Radakovich: Clemson Athletic Director (ACC and BCS/AQ member). BCS/AQ leads 7-0 on the panel. Mr. Tyrone Willingham: Former Head Football Coach for Notre Dame, Washington and Stanford (IND & PAC 12 influence with BCS/AQ member) BCS/AQ leads 8-0 on the panel. Mr. Tom Jernstedt: Former NCAA Executive Vice President and Oregon graduate (PAC 12 influence/BCS member) must remain impartial. BCS/AQ leads 9-0 on the panel. Mrs. Condolezza Rice: Ex Secretary of State, Stanford Professor and former Stanford Provost (PAC 12 influence/BCS member) BCS/AQ leads 10-0 on the panel. Mr. Steve Wieberg: USA Today Sports Writer and Missouri graduate (Big12 and SEC influence/BCS member). BCS/AQ leads 11-0 on the panel. Mr. Mike Tranghese: Big East Commissioner and retired (Non BCS/Non-AQ member and AAC influence) One of two members for the NON-BCS/Non-AQ members. BCS still leads 11-1 on the panel. Lieutenant General Mike Gould: Former Superintendent of the United State Air Force Academy (Thank you for your service to our great nation), (MWC and Non-BCS/Non-AQ) One and only active member to argue and debate for the Non-BCS/Non-AQ programs to get one spot in the playoffs. BCS/AQ programs win the panel votes 11-2. The most immediate thought that came to my mind is; were these members selected based upon knowledge and experience as being part of a football playoff selection committees previous or name credibility/recognition based upon names associated with the committee to provide the College Football Playoff (CFP) viability and recognition to ease the fans request to some form of a NCAA college football playoff format? While reading the published article, Jeff Long, Arkansas AD said “we represent all of college football” (Kerkhoff, 2013). If you represented all of college football then would there no be EQUAL representation among the selected members based upon BCS/AQ and Non-BCS/Non-AQ, compared to a significantly weighted towards the BCS/AQ conferences and programs. Further quotes by Jeff Long state, “In this task, we don’t not (that’s how it was printed in the article) represent any one school, conference or region. Each of us will represent college football in its totality” (Kerkhoff, 2013). Jeff Long goes on to being quoted by Kerkhoff as saying ” when we serve on this committee we’re expected to check our loyalties and affiliations at the door” (Kerkhoff, 2013). It seems to me that the Arkansas AD has 13-15 direct phone numbers, all SEC and BCS related, that can call him and influence his decision making process when making a final selection. My thought is, how can these committee members check their loyalties at the door and be impartial when the outside influences have direct access to their phone number and email address to directly, but indirectly make comments or suggestions to or on. The ultimate test will be for Mr. Jeff Long and the other committee members, is to their integrity to the conference, ethical decisions making skills, testing their higher centers of influence, especially if any of these athletic directors wish to advance their careers or change FBS schools, and by making the right and fair decisions to select the 4 programs who earned their way into the playoff format. With all due respect to USA Today’s Sports writer; Mr. Steve Wieberg, I am curious how your “covering 250-300 college football games not watching them as a fan but more analytically” (Kerkhoff,2013), qualifies you to be part of this committee? Covering and writing about those games, which I can definitively say that 95% of them are BCS/AQ games, does not make you an expert, just a writer doing a job. Me personally, I have examined and analyzed multiple categorical variables and variables within variables to author and publish my book to select a group of 16 FBS programs, and even then there were some tough decisions to make on the seeding and selection process. When you examine 25,000+ data points from 1996 to the present, within college football at the FBS level, and not just the games you covered, then please talk to me. Facts are the facts. Decisions like this should not be influenced by name and program recognition, but selected and seeded based upon accomplishments and outcomes by the student athletes who participate and make split second decisions in games and the coaching staffs who make timely adjustments during the game or during the week to prepare their team for games on a weekly basis in this 12-game college football season. One committee member, in my opinion, has no business being part of this committee. With all due respect to Secretary of State; Mrs. Condoleezza Rice, how and why were you selected? Is this the At-large, un-bias selection committee member who can keep the legal aspects of the decision making process in the forefront, staving of any possibility of an antitrust lawsuit from the Non-BCS/Non AQ members and conferences against the power brokers of college football? She was a politician and lobbyist as well, she can use her legal influences, charm and communication skills to persuade committee members too. Yes, the names selected gives the committee name recognition credibility only, but no true validity to the selection of 3.1% of the field. There are many questions that need to be addressed before this committee is to convene and to start making the $50+ Milllion dollar decisions. Yes, there decisions are going be tough ones, tougher than determining if the student athlete is eligible to play, did we meet compliance this week, are there any recruiting violations, which TV contract are we getting this week and so forth. This committees toughest decision is how can they remain true to all 127 FBS programs in a Stuart Mills approach, without being swayed, convinced and bias to their own conferences, programs and alma maters. The ultimate objective of this committee is to select the right and “just due” 4 FBS programs, not the most notorious programs based upon what the so called “experts” from ESPN, FOX, USA Today, CBS Sports, NBC Sports, Yahoo Sports or any other sports affiliates who show, print or televise multiple college football shows and experts say during the season. Experts who use the “crystal ball” method to select who will win the game, who should be ranked and in which order and who will be playing in the BCS National Championship Game in January 2014, when all the games have not been played. If I had known, they were seeking applicants to be committee members, I would have submitted my vitae and book as evidence to be considered as a committee member. My objective was not to slander or make light of these 13 members on the committee, but to significantly point out to the sports world and fans, that this committee is BCS/AQ HEAVY and that every college football fan knows that the first 4 FBS programs selected and seeded, will be BCS/AQ programs. Thus, not considering any of the more than qualified Non-BCS/Non AQ program, whom will again, will be on the outside looking in again and again. Did not the BCS process prove that the Non-BCS/Non AQ programs are not allowed to play on the same playground as the BCS/AQ programs when it comes to competing for the national championship? Have the fans not seen enough of the bias towards BCS/AQ conferences and programs in direct relationship to the (2) human subjective voter polls bias and BCS/AQ manipulation of the 6 computer programs. Seems to me that the Non-BCS/Non-AQ programs are just as deserving to compete for the 2014 NCAA Men’s FBS Football National Championship as the rest of the 127 FBS programs. I guess we will have to wait and see when the first 4 seeds are announced in over a year from now. Observing how the influence of sports writers, sports television shows, major television sports companies and the so-called “experts” use their microphones, air waves, televised shows and print, to verbalize the subliminal messages at the 13 committee members to select who they think should be the first 4 teams. Kerkhoff, Blair. (2013). “College Football Playoff committee officially unveiled”. Greater Hazelton Standard Speaker, Thursday, October 17, 2013. Page B4. In a World Wide Web and/or newspaper article, posted in the The Indianapolis Star on July 25 2013, written by Mark Alesia, who was given a independent/exclusive interview to Dr. Mark Emmert, President of the NCAA, to discuss a future topic within college athletics that deals with changing the landscape of college football at the highest level. After reading and dissecting the article, it’s seems very apparent that the “powers that be”; the commissioners of the 5 major FBS conferences are starting to turn the screws on the NCAA asking for major changes or what they call “significant strategic advantages”(Alesia, 2013). College football at the FBS level possesses a governance model and rules that are to stringent for them to operate under and follow for the student athletes. With all due respect to the NCAA and Dr. Emmert, stand your ground along with the remaining 280+ NCAA Division 1 institutions. A. The SEC, B10, B12, ACC, P12 and Notre Dame want to eliminate the current governance model that they are under and create their own division of athletics, calling it Division IV (Alesia, 2013). The governance model may possess many rules and could use some adjustments, but remember they all agreed to this as signing up to be a member of the NCAA to display the NCAA logo and brand. These are the rules that are to be followed by all. It seems that the power brokers are ready to start a coup and upset the grocery cart for the betterment of themselves and themselves only. By allowing the power brokers and conferences to create their own division and create their own rules, you not only create a monster, but a “God like complex” monster with no governance, institutional control and all the money. College athletics is not Monopoly. However those with the most money, like the power brokers, get to make the rules, solicit large sponsors to increase revenue dollars to their ever growing financial bottom lines, recruit and pay the best student athletes regardless of academics, eliminate the Academic Progress Report(APR) which is part of the governance rules and these are just the major leverage points that would drive the wedge further between the “have” and the “have nots”. Also know as “BCS” and Non-BCS”. Another point to not allowing this leverage and wedge between the BCS and Non-BCS programs and conferences is, this provides the power brokers a significant upper hand and stranglehold in the recruitment process of student athletes who would only see the money and prestige. The Non-BCS conferences would slowly fade away, like the old west. All we would see is tumble weeds, no television coverage and limited media reporting. We all know that only the media follows winning and prominent programs. Credible Non-BCS programs like Boise State, Nevada, Louisiana Tech, Hawaii, BYU, and Louisiana Lafayette to name a few there and others, will be forced to pay large exit fees, $$$$(money), from their current conference and forced to pay the large entrance fee to join one of the power five. The split and divide would also eliminate games scheduled between BCS and Non-BCS programs, thus creating a larger financial gap between the classifications. The arms race was already getting out of hand and is significantly getting further out of hand. At what point do the Non-BCS conferences and programs say enough is enough? This is just like the roaring 20’s with all the gangsters calling the shots and everybody afraid because no one wants to challenge the power brokers. Even the police, governance model at that time, were afraid of the gangsters. Until they said enough was enough we are taking back some control of the bullies. It seems that the power conferences and brokers are using the disparity in budget differential as a measurable categorical variable to be part of their elite and sense of entitlement style of operating. The comment made by Dr. Emmert states, “There’s a need to recognize there are Division 1 schools with $5 million athletic budgets and the $155 million athletic budgets, and trying to find a model that fits all of them is the enormous challenge right now” (Alesia, 2013). This tells me that the power conferences and brokers want a devised and regulated system based up financial budgets. If you don’t meet a certain budget requirement, then you belong to this group. This is more and more sounding like the English Premier Soccer League model, but with the relegation not determined by wins and losses but in how large your budget is. This part of the arms race for supremacy is starting to change the landscape of college football from equality, opportunity for a great education and association to those with all the money get to make the rules and tells everybody else, either join or you get left behind. This sounds like the middle ages, a King and his Kingdom with merry jesters and supporters (BCS conferences, power brokers and commissioners) and everyone else are the peasants (Non-BCS programs, conferences and non football FBS schools) who have to scramble for scraps that the King’s throws out them in an effort just to kiss the hand or be in the presence of the King. B. These 5 conferences plus more than likely Notre Dame, want to change the governance model in which all NCAA institutions follow and create their own governance model, rules and which would ultimately lead to their own private playoff system. Leaving the remaining 60+ FBS/CFB football programs to fend for themselves (Alesia, 2013). Who will oversee the governance of the power conferences and their brokers? Was that not why they created the NCAA logo, rules and by laws to keep all on the same playing field. By allowing the power conferences to segregate themselves form the governance model will significantly increase the power they already have. The power conference main argument is “there are 140 committees” (Emmert,2013) that makes decisions and feels that its spread to thin and decisions or changes take forever to be adopted. If there are too many committees, then create an 11 member committee who would have the best interest of ALL NCAA athletic programs and not those with all the money. The 11 member committee would act like the Chief Justices in the Supreme Court, knowledgeable and can make a Stuart Mills approach in the decision making process when things need to be addressed. Within that 11 member committee, they would have at least and no more than 4 staff members, not higher centers of influence who can sway the decision thought process. These 4 staff members are highly educated in the NCAA policy, procedures, academics, by laws, compliance, eligibility and all the rules and how to bring those rules up for a vote or discussion, using educated members of society to offer their knowledge on those specific topics with the best interest of all involved. All the power brokers sees in front of them is the money they would generate to assist into offering their recruits and student athletes the stipend they so rightfully believe they should be getting or be distributed. This within itself would tip the scales in their favor in recruitment advantages. The power brokers and commissioners only see the fairness in which they would receive in increased support, advertising dollars to best suit their needs like a Democritus society and just say “yes we are seeking the best interests for all”. When in reality, its all about them and how far they can distance themselves from the peasants. C. The 5 power brokers WANT, not suggests, to provide $2-5K athletic stipends to all scholarship student athletes for the “full cost of attendance” (Alesia, 2013). The one question that needs to be addressed to these power brokers is, what makes their student athletes significantly more important than the other student athletes who are being recruited by other NCAA Division 1 FBS programs? Since when did high school athletic talent, which is a great accomplishment within itself, become a financial right chip to be paid for? College athletics is not a job, its an opportunity to display your athletic talent and skills where by, you were allowed the opportunity to earn a quality education with cost covered by your athletic talents, which would assist you in obtaining knowledge. That knowledge which is provided by higher education professors and doctoral professors who are qualified to educate these young students and student athletes in the program of study in which they want to strive for as part of our working professional society. The athletic stipend is a great idea, but is being used as a bargaining chip by the power brokers to draw a line in the sand. I would like to see athletic stipends be implemented, but implemented properly and with accountability on both sides of the table. I understand that student athletes can not work while on athletic scholarship to earn some extra cash. Maybe that governance rule needs to be addressed in addition to allowing the student athletes the ability to work 8 hours, one day a week to provide them with responsibility outside of education and athletic which will prepare them for a working class society. Everyone does not become a professional athlete. The price in which college athletics are measured by at this level, should not be by, what you do to win the national championship, but in how working towards a national championship in relationship to developing life skills, accountability, education and offering employment experiences to these student athletes makes them a more well rounded person. If athletic stipends are going to be implemented then the power brokers cannot segregate themselves from the rest of the group. There should be a discussion on revenue sharing, like professional sports. If the power brokers are sincere in this idea of student athlete stipends, then I would be the first AD at this meeting in January asking them to consider revenue sharing and creating some form of accountability to the student athletes to earn those stipends. D. Big Ten Commissioner, Jim Delaney, states “he wants lifetime scholarships for athletes to finish their education and a non-athletic year for “at risk” students, followed by four years of eligibility” (Alesia, 2013). Dear Mr. Delaney, with all due respect to your experience, knowledge and dedication of athletics, please explain to me by using peer reviewed journal articles that significantly supports that student athletes should be given a significant advantage over the general population student to be guaranteed a scholarship to complete their degree related field? I would be more than willing to read about it. Even the general population students seem to struggle academically and need to stop their education or return later when they are more mature. The key aspect we forget is that these are students, who are athletes, who need to have some educational knowledge to be part of our society if they part of the 99% who are not given the opportunity to play at the highest level of professional athletics. The student athlete is there to learn a degree related field which will prepare them for life and have something to fall back on when they stop their professional career or seek a career in a professional career environment. If you want to provide lifetime scholarships to student athletes in addition to creating a non athletic year for “at risk” students, then it this needs to be offered to the whole student body and not just student athletes. As per the “at-risk” student athlete, then we should educate coaches to be more observant of academic abilities over their athletic talent in which they recruit. We need to stop mollycoddling the student athletes and make them accountable for their educational advancements. By offering the student athletes automatic scholarships and stipends sends the wrong message to future student athletes that, education is not important but your athletic skills guarantees you an automatic free education with no sense of urgency to learn academically. I totally understand that a large percentage of student and student athletes struggle on certain topics. They would not be considered as “at-risk” student athletes if they were not catered to on ever thing. Yes; assist, guide, help, tutor, studies halls, study groups and do whatever it takes to let them achieve the grade they need to earn in the classroom environment. The onus should be on the student athlete learning academically as possessing a great experience athletically. E. What the power brokers have already lined up, ” the power football conferences have a 12-year, $5.6 Billion ($5,600,000,000.00) deal for television rights to the College Football Playoff starting with the 2015 season” (Alesia, 2013). How is it the power brokers and the 5 major conferences can collaboratively line up a large 12-year, Billion dollar contract to promote a playoff environment for them and create a platform to create regulation in need of change that benefits them, but cant seem to put their heads together in a collaborative effort to create a playoff format that would be INCLUSIVE to all 125 FBS programs and future FBS programs. Again, thinking hedonistically for their own personal gain and not to assist all involved at that level. Just think what a portion of that money would do for the Non-BCS programs who compete at the same level of athletics, play by the same game rules and NCAA rules as the 5 power brokers and conferences. Just think what a traditional 16-team playoff format would do for college football allowing everyone a criteria based opportunity to compete for the national championship versus the 69 BCS programs who do now and then 60-62 BCS programs starting in 2014. What the power brokers and commissioners are afraid of is losing and losing that opportunity to not only be called a national champion, but the financial implications that comes with competing for the title. They fear that if they allow the Non-BCS members an opportunity to compete for the national title, they could possibly lose and not receive the notoriety, prestige and financial wealth. Thus allowing the pendulum to swing away from their control. This is like a young child who is very possessive of his toy and does not want to give in or give it up. Why do you think that the power brokers and conferences possess a significant home field advantage in their non conference schedule, which generates more revenue for them and manipulates and skews the 6 computerized systems and 2 human subjective polls used in determining the current national champion. In a published book, research performed by and authored by myself, “College Football in the BCS Era, The Untold Truth: An Analysis of Factors that Supports the 16-Team Playoff Model” examined that very specific variable. For example and proven since 1996, the Southeastern Conference (SEC) holds the highest non-conference home field scheduling rate of 79.8% compared to the rest of the FBS conferences. Also proven since 1996, Alabama winner of the last 3 of 4 BCS titles holds a 90.2% in home field advantage in their non-conference scheduling practices. They have figured out if I don’t have to play on the road for a non conference game, convince other FBS programs to play at our stadium or a site centrally located near us and luring them away with money that they significantly decrease their chances of losing and the significant advantage to the large $17 Million dollar championship game. That’s 9 out of every 10 non conference games at home or in their own backyard with significantly less travel time and distance. How do you think Alabama and the SEC can afford to pay their coaches those salaries, lavish facility improvements and no one challenge them on how they did it. This hedonistic approach by the power conferences and their conference commissioners are only looking out for themselves and themselves only. From my perspective, in which I can not prove as of yet, I believe that the Atlantic Coast Conference (ACC) and the Pacific 12 (PAC 12) are along for the ride on this train. They see the money trail that can be generated and how that money can best serve their hedonistic needs. What can be significantly proven is that this train is being led by Southeastern Conference Commissioner, Mike Slive and Big Ten Conference Commissioner, Jim Delaney. Its also noticeable that the Big 12 Conference Commissioner, Bob Blowsky, is now on the same train as Mr. Slive and Mr. Delaney. Intuition tells me that Mr. Bill Hancock, Commissioner of the Bowl Championship Series, is also part of this train ride but there is nothing printed with his name associated with this move. I would be the first to apologize to Mr. Bill Hancock, if he is not part of this train ride. It seems evident that this group of power brokers and conferences have “drawn a line in the sand” forcing the hand of NCAA President, Dr. Mark Emmert, to force a summit to discuss this option without fully investigating if there is a more Stuart Mills approach that would be beneficial for all under the same NCAA logo. The key aspect to the power brokers making this decision is that it creates a huge debate topics and provides them more leverage to make financial decisions which are significantly Democritus. If the NCAA and its 280+ other non-significant member institutions allows this to happen they have no one to blame but themselves. This divide between the power brokers and the conferences would not only significantly change recruiting practices, but significantly making it tougher for the Non-BCS conference and programs to compete in that arena. They will have no financial leverage to offer recruits, like the power brokers and conferences. If this summit does go through and the power brokers get their way then this will push the discussion of anti-trust lawsuits that much closer to the table. Involving not only lawyers, but congress as well. I am all for a playoff system but the system needs to be designed for ALL FBS programs. That’s why I authored and published my findings. Its an inclusive approach to determining a national champion in college football at the FBS level on the NCAA. The money generated by my 16-team playoff format would benefit all FBS programs with an equal and criteria based approach, making it fair for all. A fair for all premise the 5 power brokers do not believe in or wish to discuss because they would not have any control over it, no matter what they say or publish. There is always the hidden meaning behind their objective. With that large sum of money of $5.6 Bil. on the table to be gained by television revenue and sponsors for airing this playoff format, then why can’t the Non-BCS programs have an opportunity to participate. Athletic level is not determined by financial budgets, but by athletic ability and the cognitive abilities of both coaches and players to make the right athletic decision at the right time. Mark my words, when the 4-team playoff format arrives in 2014, the 4 slots will be filled by BCS programs and will always be filled by BCS programs. Until they advance the playoff format to 8 or 16 teams, the Non-BCS programs are still the peasants in the kingdom run by the (5) Kings of College Football. Again, its a hedonistic approach in which the 5 power brokers want to operate, but no one wants to stand on the other side of the line that they drew in the sand and debate the topic with them. Please let me be the one that represents the Non-BCS and non FBS football Division 1 programs at this summit. Alesia, Mark. (2013). “Indy Star: NCAA president Emmert vows ‘fundamental change’ in how top divisions make rules and policies” retrieved from the World Wide Web, google search on July 25, 2013. Purchase my book by clicking the icon in the upper left corner. Who has my book as of this date and either reading it or possibly reading it: President Barack Obama, NCAA President Dr. Mark Emmert, 2 college president, 2 college athletic directors, 1 college football head coach. NCAA Targeting Rule: Right or Wrong? Starting in the 2013 college football season, a player can be ejected from a game, plus adding a 15-yard penalty at the completion of the play, for targeting. Is this the right decision or the wrong decision? Its possible it could be a little of both. I understand the purpose, motivation and the implementation of the rule; for player safety and to decrease, with the increase rise in student-athlete concussions and injuries from targeting. With the rule in place, this now causes more subjective assessment to the men and women who are in place to regulate and apply those rules to the action on the field. Many athletic directors, coaches and sports writers have stated, “the rule will be tested in the first game and over the course of the first weekend of games”. This is so true. I examined this rule from an athletic administrators point of view, seeing the whole picture. As an administrator, this means that I must have complete competence in my coaching staff to teach proper tackling techniques and proper reception of a tackle by a player. In addition to, implementing sportsmanship in a game that possesses historic gamesmanship and now we add SIGNIFICANT amounts of money on the line from sponsors, bowl committees and to compete for the “national championship” of college football in an already flawed and skewed system that determines who should compete for the national championship. There will times during the season that a key player will forget about the “targeting rule” and play football they only way that has been ingrained into their minds, hard, fast and to win. This will cause the player to be ejected from the game that could be tied, one-possession difference, two-possession difference or just out of hand. Coaches will have their patience, attitudes and coaching etiquette put in check and tested, all from this rule. From the men and women who will be refereeing these highly energized games, conference, non-conference and rivalry games, they are going to make split second decisions on ” not to” or “need to” throw the flag in these situations. Remember they are human, making split second decisions on is this targeting rule and situations, did the offensive player change his head or body position to make it look like a targeted hit and how often will the coaches lobby on the sidelines for those types of calls when the targeted hit is just a hit/tackle. Then we add the increased consciousness of where the game is played, whose fans, national television, sports commentators trying to analyze the hit, because they have 15 different camera angles to watch instant replay over and over to examine a frame by frame hit. The referees might miss some calls or make calls that were not right, but an ejection occurred. In a split second, judgement, subjective call, the referees need to determine intent of the hit/tackle and if it warrants ejection. We need to support the referees decision, because they are there to govern the rules that they are trained in and to wear those stripes. The most interesting aspects about the implementation of this rule are three. One, they are implementing a rule that possesses no statistical facts on the number of targeted hits during the course of a specific time period of college football, analysis, research or peer reviewed journal articles that supports the penalty to be enforced to the rules implementation. Two, with the increase of targeted hits and increased concussions with student athletes and professional athletes, the media and coaches needed a rule in place to protect the athletes. I get that, totally understand and respect the need for the rule, but not the implementation. Finally, the onus is on the referees to make the right decision with no experimentation to the rule, during regular season games, this does not include spring practice games when the rule was first implemented. If research, statistical evidence and peer reviewed journal articles are out there to support this stringent penalty to the rule, please let me know. I would enjoy reading it and analyzing it for validity. That means articles written and published by educators in journals that possess accreditation, possess reputation and peer reviewed. An article written by a sports reporter is credible but not valid in the education sector. A. First time a player is called for targeting, automatic 15-minute suspension from the game or into the next game, pending on when the penalty occurs within the time frame of the game. The player can return after serving a mandatory 15-minutes penalty of no play. Coaches should take the players helmet and shoulder pads away for 15-minutes. This will allow the player to cool off, understand that he cannot make targeted hits and offers coaches an opportunity to educate the player(s) on what they did wrong and instruct them in how to correct the actions. This also puts ALL players in the game on notice, that these types of hits will not be tolerated and the referees are doing the right thing. This also take less pressure off the referee to automatically eject a player for a targeted hit. Make the call for the targeted hit, but educate and coach. The ONLY sub-rule that supercedes Rule A is, if the player that is called for targeting and injury or fatal injury occurs; such as concussion and/or paralysis, then immediate ejection and a 1-game suspension should occur no appeal process. B. If the same player or the next player initiates a targeted hit, on either team, then automatic suspension/ejection from the remainder of the current game and the next game should be implemented. Student athletes will learn from what the first player did to receive the 15-minute ejection/penalty and mentally take note that they need to focus on working together for the promotion of the game, sport, safety of all players and sportsmanship. C. Conference commissioners and rules committees should not fall to the lobbying that athletic directors will take into reviewing the call after the game is over. There will be no over-turning of suspensions. The rule is in place, they need to accept it. All the players, coaches and athletic administrators have been educated on the rule, the purpose of the rule and must accept the decisions made by the referees for the just cause of ejection to the rules. The two phase process is more utilitarianistic versus hedonistic, in which the current rule is now. I am all for player safety and the improvement of the game, but rules such as this that causes the need for split second, judgement and a subjective thought process, is going to create a media frenzy. When Player X is ejected, from Team Y, from Conference Z, during game A, who are competing for the possibility of a “national championship” game, with SIGNIFICANT amounts of money on the line from bowl games, sponsorship and recruits wanting to associate with winning programs, this is where the media frenzy will start and lobby for a change to the rule. The two phase ejection rule, which I would have submitted to the rules committee, would have a better due process, offers players that second chance with the 15-minutes suspension from the game, opportunity to educate the players from the coaches perspective. Rash, quick decisions and implementation of rules without research to support the need for the penalty phase, will always come back and bite those hard for implementing the rule and ejection process. The rule is the right decision, the implementation of the ejection process is wrong. My book : College Football in the BCS Era: The Untold Truth is available by clicking on the picture ton the upper left side of the screen. $20 +SH/TAX perfect for reading prior to the 2013 college football season.